Close-grip benches are a triceps staple that also hit the inner pecs pretty hard, making them a good choice for the start of your arm workout (because of their multi-joint nature) or a way to add volume on chest day that targets an oft-overlooked area. But like everything else, your body gets pretty efficient doing them over time, and the results you get start to diminish. Normally, you do them on a flat bench, but there’s no law that decrees such. Want to introduce some variety into your triceps workout? 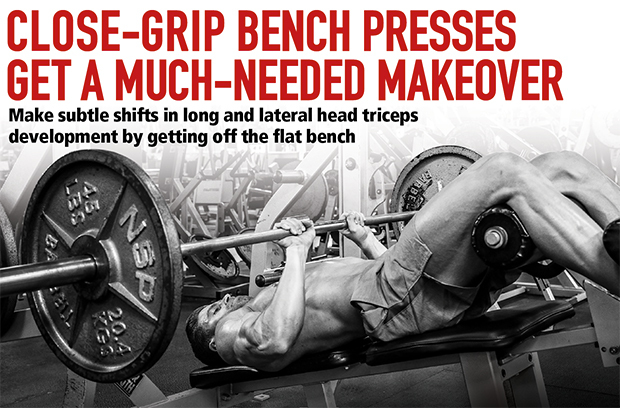 Try close-grip benches on a slightly inclined or declined bench instead! Consider that with a flat bench your upper arms start in a perpendicular position to your body, which allows you to hit both the lateral and long heads. But with an incline, now you have to keep your upper arms angled back more toward your head; after all, to maintain control of the bar, you now must be holding it perpendicular to the floor, not your body. And when on a decline bench, you’re now holding the bar such that it’s angled more toward your thighs in the start position. Remember, the long head is attached to the shoulder blade, and it’s only when you raise your arm overhead that it can be fully stretched, which allows for a stronger long-head contraction than when your arm is by your side. Hence, anytime you can position your arms closer to an overhead position, you’ll get more triceps long-head activation. Likewise, lateral-head movements get greater stimulation when your hands are in a position by your sides, as when doing pushdowns and kickbacks. Here, the long head isn’t being stretched nearly as much, so its contribution is greatly diminished. Hence, the angle of the bench—and the many in-between angles between incline and decline positions—you use with close-grip benches can make subtle changes to dialing up and down which triceps heads are most stimulated. Consider that a great way not only to introduce variety into your arm training but also to more fully develop the target muscle. What’s more, you can even try this approach with skull-crushers, a single-joint exercise in which your upper arms are locked perpendicular to the floor (and your body, but only when using a flat bench). Here, too, you can take one common exercise and turn it into three!